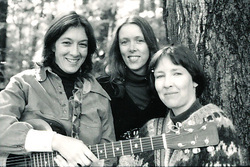 For a couple of years in the early 1980's, Cindy Mangsen, Carolyn O'Dell and myself did a couple of concerts a year as "The Three C's". We all loved the music we made - lush harmonies and fine instrumental arrangements weaving through our VERY wide musical backgrounds & resources. Then Cindy met Steve Gillette, Caroline had a couple more children, and I started touring more solo. Carolyn recently put together this wonderful photo montage with a recording of "Church Street Blues" from a concert at Lena's. Thanks Carolyn. I started playing cello a couple of years ago - not likely to be a concert instrument, but I love it. 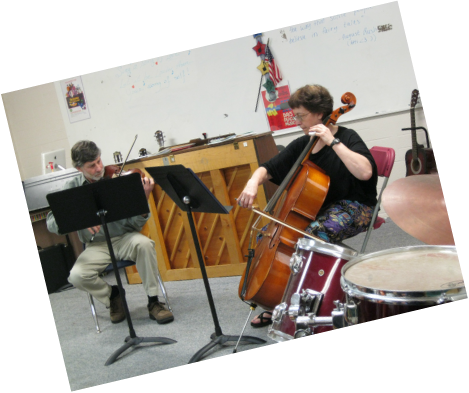 Howard played two duets with me in my first (and only) cello recital - so far.